Do you prefer BCAAs over whey protein supplements? MusclePharm BCAA 3:1:2 might be the right product for you. MusclePharm BCAA 3:1:2 is a muscle-building supplement that is designed to promote muscle development and maintenance. There aren’t many BCAA products out there, and based on our own experience, BCAA products only differ in the dosage. The 3:1:2 ratios are derived from the branched-chain amino acid ratio of MusclePharm BCAA 3:1:2. 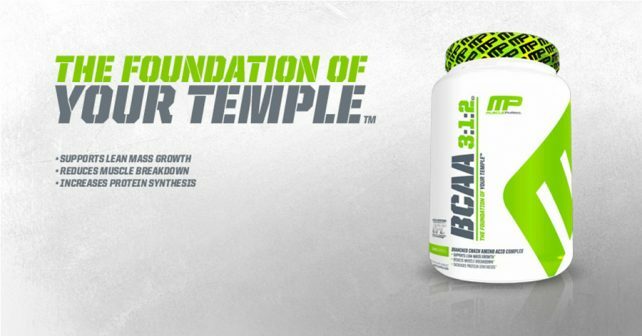 MusclePharm BCAA 3:1:2 is in capsule form, which is atypical from the BCAA products on the market today. MusclePharm BCAA 3:1:2 has a big serving size of 8 capsules per serving, which means that you’d have to carry around a big bottle of the product, or at least a big medicine box to take the product on-the-go during the day. BCAAs or branched-chain amino acids aren’t for everyone. More often than not, if you’re already taking enough whey protein supplements, you wouldn’t need to take BCAAs because whey protein supplements already contain BCAAs. In simpler terms, BCAAs are absorbed faster by the body, but not everyone needs it to be absorbed right away. Whey protein products offer a better solution for the majority of recreational athletes and bodybuilders since whey protein is cheaper and it contains calories, which is needed during workouts. Who uses MusclePharm BCAA 3:1:2? Individuals who are in the cutting phase of their workout may take MusclePharm BCAA 3:1:2 to prevent muscle breakdown during exercise. MusclePharm BCAA 3:1:2 is meant to be taken prior to your workouts to lessen the likelihood of experiencing muscle catabolism. MusclePharm is known for producing outstanding products like Combat and Assault. Although their products aren’t perfect, there surely are other companies that produce far worse products than they do. Like anyone who has had experience with MusclePharm products, I was expecting something more to MusclePharm BCAA 3:1:2, but there isn’t much to go on with the product. MusclePharm’s 3:1:2 ratio isn’t really special compared to other BCAA supplements, but it is indeed in more accurate doses since it is taken in capsule form. The use of a capsule may be a hit for some, but others would prefer BCAAs in powder form, like SciVation Xtend. We like the idea of using capsules, but that just goes down to the user’s preference. 240 capsules for $18.80 may be a bargain deal for some, but you need to understand that you may need to take up to 24 capsules of MusclePharm BCAA 3:1:2 in a day, so that brings it down to only 30 servings per bottle, which can only last 10 days and $1.88 per day if you take 3 servings in one day. MusclePharm BCAA 3:1:2 gives a great option for those who would want to cut fat while retaining muscle mass. However, the key approach missing from the entire point is the nutrient delivery, which can be improved by taking the best muscle building supplement – NitroGenix 365. Instead of focusing on taking BCAAs, you could get more results by taking NitroGenix 365, which boosts your nutrient delivery system, ensuring that your muscles get the nutrients it needs to prevent muscle catabolism.